The no-f*cks-given, no-holds-barred guide to living your best life Ever find yourself stuck at the office--or even just glued to the couch--when you really want to get out (for once), get to the gym (at last), and get started on that "someday" project you're always putting off?You need to Get Your Sh*t Together.In The Life-Changing Magic of Not Giving a F*ck, "anti-guru" Sarah Knight introduced readers to the joys of mental decluttering. 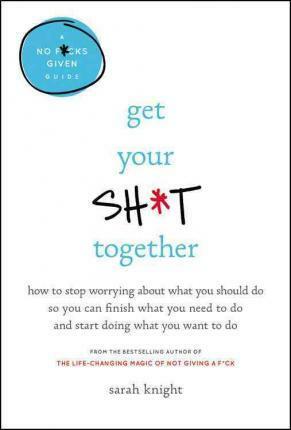 This book takes you one step further--organizing the f*cks you want and need to give, and cutting through the bullsh*t cycle of self-sabotage to get happy and stay that way. You'll discover: The Power of Negative ThinkingThree simple tools for getting your sh*t togetherHow to spend less and save moreWays to manage anxiety, avoid avoidance, and conquer your fear of failureAnd tons of other awesome sh*t!